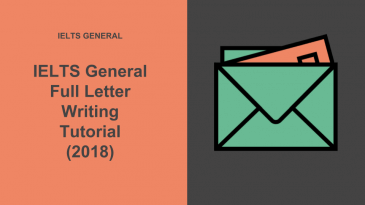 IELTS Writing: General Task 1 Letter Samples, phrases and tips. I think IELTS writing general Task 1 is the easiest of the writing sections because you are expected to use ready made phrases. You see, IELTS formal letter writing in English consists of standard phrases and structure, most of which are outlined below in this tutorial. Also, you can use the question as a ready made plan to follow for your writing, you can write a few sentences for each bullet point in the question, and you have a well structured answer covering the task response requirement. Below we have a large list of questions, samples answers and phrases to help you with your online IELTS preparation. Here are the official IELTS Bands descriptors for pdf download. Example Letter: You ordered an item from an online store and it has arrived damaged. Example Letter: Your internet connection has been slow and intermittent. – Your past experience in a similar position. IELTS writing sample: You would like to join the local orchestra. IELTS writing sample: Your children go to a local school that requires volunteers to accompany school science trips. If you have any further questions please do not hesitate to contact me… I am available between the hours of 2pm and 4pm Monday – Thursday. I am writing to apply for the position of… My responsibilities included…. IELTS writing task 1 sample: You will be graduating from university and would like to invite your family to the ceremony. IELTS writing task 1 sample: You have won a holiday to Hawaii with one extra ticket. Task 1 sample: Write a letter to the newspaper editor about an experience you had at a restaurant. The experience can be good or bad. Describe your experience in detail and state whether or not you recommend others to visit the restaurant. Task 1 sample: A friend is considering buying a house nearby, but you have decided to leave the area due to a rise in crime. IELTS task 1 writing sample: A new neighbour has moved in next door and has taken your main rubbish bin. IELTS task 1 writing sample: You would like to be work in a different city to be closer to your family. IELTS task 1 writing sample: You live near a record shop that sells music, movies, and books. – Why are these papers important? I am writing in regards to a recent journey I made in a vehicle from your fleet on June 1st, 2018, more specifically, from London Mayfair to Piccadilly station, starting around 4 pm and finishing 30 minutes later. Immediately after entering the taxi that afternoon I immediately started reviewing some very important documents containing confidential client data. I have strong reason to believe I left these documents in the cab upon reaching the destination. These papers are of enormous value because of the information contained, and if they fall into the wrong hands there could be profoundly serious implications for myself, and possibly your firm too. The documents concern an extremely sensitive governmental topic regarding national security, it is therefore of paramount importance they are found and returned to me as soon as possible. As a result of this, I need your firm to check the security camera in the cab of the aforementioned date and time, and please send a copy to this email address: [email protected] In addition, I would be terribly grateful if you could forward the contact details of the driver as I would like to contact him before the situation spirals out of control. Your assistance in this matter is of dire importance, furthermore, I would like to believe we can solve this between ourselves without the Police or MI5 interference. (informal) Can you ..? (informal) Will you ..? Sample IELTS writing task 1: Your sibling has sent you a letter asking for an update on your life. Sample IELTS writing task 1: Your best friend is moving back to your city after being overseas for five years. Sample IELTS writing task 1: Write a letter to a pen pal. This can be your first letter or a letter you’re writing after knowing your pen pal for a long time. Include details you would normally include when writing to a pen pal in this situation. I was wondering of you could help me. The purpose of an “inform” letter is to make sure that whatever important news the receiver has to get is clear and articulate. You want to ensure that your letter has a structure. This would include your introduction, your body and ultimately your conclusion. The introduction- here you want to set up the conversation of the letter. This can include a greeting, an enquiry about how the receiver is doing and then depending on how well you know the receiver a brief introduction of who you are. This is Jill, we met at the art exhibition last year. I hope this email finds you well. The body – Once the introduction is complete you need to write the reason for your “inform letter”. Jack and I engaged! I would love it so very much if you could make it to our wedding. You played a huge role in us getting together and it only makes sense that you are part of the big day. By the way, I lost all my contacts as my phone was stolen. This is my new number 123 456 789. I look forward to hearing back from you. 1. Write a letter to your colleague telling him about your planned visit to the town you use to work. – the details arrangement of your visit. 2. Write a letter of complaint about late delivery to the website where you ordered an item. 3. A local college is having an international day. You want to speak to students about your country from different cultures. Write a letter to the college head. – ask for any arrangements that you need. 4. Write a letter to a newspaper editor about the poor condition of a historical building in your area. 5. You and your friend booked a theater tickets in advance. Apologise to your friend as you can’t make it to the theater with him. – give options on what can be done with the tickets. 6. Write a letter to your friend who is starting an import/export business and asked you for recommendation for a product from your own country. – why it is a good product to export. 7. Write a letter to your friend who is traveling overseas, and you were staying at their apartment. There was a storm at that time and the apartment got damaged. – detail what repairs need to be done. 8. You are interested in attending a short course at a college in an English speaking country. Write a letter to the college administration. – what reasons make you choose this college. 1. You are living overseas and you have just come across an article about your country in a magazine where some of the information are incorrect. Write a letter to the editor. – provide some more interesting information for the editor to publish in the future. 2. You are interested in attending a short course at a college in an English speaking country. Write a letter to the college administration. 3. Write a letter to your neighbor about the damage that occurred to your car while he was parking his car in the lane outside your home. – suggest to him what actions he should take. 4. Write a letter to your friend offering him/her a concert ticket. – why you think your friend will like going to this concert. 5.Write a letter to invite your English-speaking friend to watch a new film with you about your country. 6. You have been placed to a new job the same as your friend’s who is working from another company. Write a letter to your friend to ask for help. – tell him meeting arrangements and details. 7. You’re working overseas in an international company. You are leaving the country in emergency. Write a letter to your friends explaining the situation. 8. You are moving to a new country, write a letter to the accommodation agency to rent a house. 9. Your friend from another country is interested to visit your hometown. Write a letter to him. – which places he may like to visit. 10. You are planning to give a presentation in your large company. Write a letter to your colleague asking for help. – what you would like your colleague to do. 11. Your local council have asked locals some suggestions on how to keep the city safer. Write a letter to council. – tell how the community will benefit by keeping the city safe. 12. Write a letter to the manager to ask for permission that you would like to participate in a new program. – how it will benefit your work. 13. You are currently running a course and have a part-time job. Your boss suggested that you leave your course and work full time. Write a letter to your boss. – explain the reason for your decision. 14. You have recently visited a building which is of historical importance and came to know that it’s in bad condition. Write a letter to local newspaper office. 15. You’re interested in a music course that you saw on an advertisement. Write a letter to the club. – talk about your past experiences. 16. Write a letter to the airport manager to complain about the problems that you met on the flight recently. – what you want the manger to do about it. 1. Your friend has asked you about the course details you recently took in a training centre. – Explain how the course has benefited you. 2. You work as part time and you are attending a course. Your manager offered you full time and asked to leave the course. Write a letter about your decision on job offer. – Explain why you made the decision. 3. Your work in a company has some changes and you need to take a training course. Write a letter to your manager. – What kind of training you want to take next year. 6. You recently attended a course in another country but had to leave the course to return back to your country. Write a letter to your teacher. – Explain them what you liked about their lecture. 8. You work a part-time job in a company and the company posted an advert seeking a person for a full-time position. Write a letter to your manager requesting to apply for the advertised position. – Why it would be beneficial for the company. 9. Write a letter to one of your classmates and invite him/her to a party. – Tell him/her what you are doing recently. 10. You have recently stayed in a hotel and after returning back you realise that you have left a piece of cloth at your hotel room. Write a letter to manager of hotel. – What the manager should do if he/she finds out. 11. Write a letter to the manager about the important documents which you left in their taxi. – What you want the manager to do. 12. You have recently flown to another country on a business trip. You were satisfied with the flight, but didn’t like services at the airport. Write a letter to the airport manager. – What you want the shipment company to do. – Why you think this person is suitable for the job. – What kind of person would you like to rent it to. – Explain why his/her children would like this school. – Your hopes for the construction in case it pushes through. – Why do you need it to be done quickly. – What furniture did you order? – What was the damage? – Suggest what needs to be done about it. – What is there on the record? – Why do you want to translate it? – Why is it so urgent for you to get it translated? – What course was it, and when did you take it? – What did you like about it? – What improvements can be made in the future? – Give more information about the friends current lives. – What actions you expect to be taken. – What you want from him to do. – How does it affect your street? – Give some suggestions and request action. – Explain the situation and roads’ condition. – – Giving some suggestions. 2. You are working in a giant company which does financial or other items help to the different group of local community. Write to your manager about some group you want to provide help next year. – What help do the group need. – What kind of help you expect to provide. – Apologise for not coming. – Explain how did you try to contact him/her. – What is the alternate plan. – What can be done so more people can use it. – Explain the problem of no parking space available. – Suggest a solution for the car park problem. – Explain how this will help your company. – Say what actions you would like them to take. – Why do you want to join the trip? – How could you help during the trip? – Ask some questions about the trip. – What you want manager to do. – Describe your future wife/husband. – How did it help you. – Explain the reason for using a bicycle to commute. – What problems have you encountered with parking? – What are your recommendations to solve them? Video: IELTS General Training for the Writing Task. Struggling with General IELTS Writing Task 1? Check out these samples of Task 1 essays, a very effective way to master this task quickly is to write them out, copy them, pen and paper. Use the look-cover-write technique for this. Alternatively, if you are preparing for the Academic module, why not get familiar with the task? Have a look at these sample questions. If you are serious about improving, IELTS Essay Correction can give you feedback on your essays in 24h, getting your work corrected will help you identify errors (Grammatical Range and Accuracy) and improve much faster. Another component for your IELTS success is Lexical Resource, here is an in depth tutorial to help you boost your essays. To contact Ben and the team you can send an email after signing up.